The Southern Poverty Law Center is back in the news because of the shooting at the Family Research Council, a group the SPLC had designated a “hate group” along with the Klan and Neo-Nazis. Based on the available evidence, it is clear the shooter was motivated by hatred of FRC’s positions on homosexuality and gay marriage. It also seems clear that the shooter was caught up in the recent anti-Chick-fil-A hysteria, as he carried Chick-fil-A sandwiches in his backpack along with more ammunition. As detailed in my prior post about the shooting, SPLC’s hatewatch gives cover to hate, I previously have taken SPLC to task for exaggerating the supposed presence of the Klan in Rhode Island. My own investigation in 2010, along with a subsequent investigation by the police in reaction to the SPLC listing, revealed no active Klan groups despite such a group being listed in SPLC’s annual “hate map” (link is to current) and listing of “hate groups.” The supposed Rhode Island Klan group was nothing than a listing on a Klan website someplace in the Mid-West. SPLC’s hate map at the time listed a total of three hate groups in Rhode Island, but there was no information as to the other two supposed groups, reflecting how SPLC inflates the number of hate groups. SPLC also counts each supposed state branch of each hate group as a separate group, which again inflates the numbers. If some neo-Nazi website claims to have branches in all states, that would be 50 hate groups to SPLC. 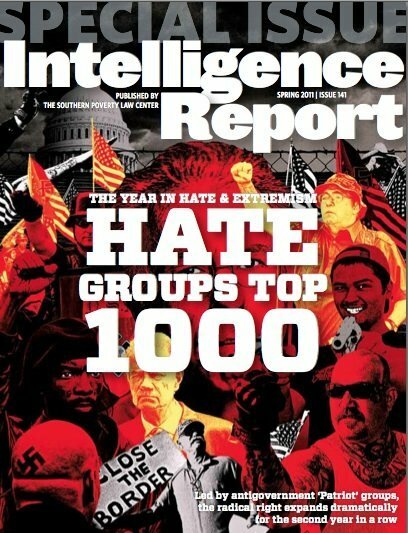 Which groups among the 1000 or so “hate groups” listed by SPLC do we really need to worry about? Your guess is as good as mine. The problem has become worse since SPLC decided to wade into the political and religious controversy over gay marriage and sexual orientation. SPLC now lumps the Family Research Council and the National Organization for Marriage in with the Klan and neo-Nazis. It must do wonders for SPLC’s hate group numbers and fundraising, but it further tears apart the political fabric of the country. Whenever Dees needs another embellishment for the palace that poverty built he expands the definition of a hate group. Non-profit work seems to pay well! Oh, it pays very well with Dees drawing well over $350K/yr plus all the benefits of the job. What bothers me about the SPLC “hate” list is that I didn’t see any of the known Islamic compound sites listed there. I know there was one (at least four years ago) between Columbia and Sumerall, Mississippi. The county sheriff’s department told me that they were not allowed to enter the compound, and that if someone on the compound got sick and needed an ambulance, the residents there brought the person to the gate to meet the ambulance. Robert Spencer and Pam Geller (mentioned with a caveat because I think they both are a bit alarmist) have reported on these compounds a number of times. Islamberg, N.Y. was one such compound and worried a number of people for reasons such as hearing the rounds of AK-47s being fired. SPLC loads its list up by listing the same organization in numberous locations. I noticed it also listed the Jewiish Defense Fund as a hate group. But it did NOT list any Muslim hate groups and only listed NOI as a black supremacist group. SPLC is, IMHO, itself a hate group. And it does nothing to counter “southern poverty.” Perhaps that is because it is too busy dumping money into a Cayman Islands bank account so its founders can live large without IRS scrutiny. It also defames the group. It demonizes the group, and all members of the group. There must be a way to stop this “Alisnky-ization” of any and every group – to use the Frankfurt School’s principles to shut down public discourse and free speech. Something many miss in this discussion: freedom of expression and political speech, traditionally (at our founding), had limits: when it crossed a line to malign, defame, or otherwise harm another in a slanderous, malicious, libelous manner, that used to be considered the limit to that “freedom.” No more – modern court rulings and the ACLU (and other like groups) have taken care of that. Our courts have damaged our society in so many ways – CJ Roberts’ ruling this past June is a prime case in point. However, it is tragic how these Men (and Women) in Black have damaged our Constitutional Republic – nearly beyond recognition, in ways great and small – yet all profoundly wounding and eating away our liberty, our individual sovereignty, our identity. They couldn’t care less. They’re highmindedly concerned with “hate”, you see — the sort that suits their orthodoxy and needs of projection. The SPLC generates a kind of moral miasma of confusion, wherein truly hateful groups like the New Black Panthers and the KKK are sloshed together with people who simply hold a non-PC view of marriage. That, of course, is abhorrent to anyone with a working moral compass. But, as is apparent by the many references one can see in the press to the SPLC’s listings relating to moral lobbying organizations, moral compasses are not common. So, like Media Mutters, and Talking Points Memos, the SPLC’s output is just so much propaganda for pay, supporting the Collectivists, and providing grist for the Mushroom Media memes. Libel does violence to a person’s/organization’s reputation. The pernicious effects of libel can foster hatred and soon become the rationale for violence in a troubled person’s mind. A Gmail address does not a hate group make. I too live in RI and have never seen nor heard any sort of hate groups being active here, except unions. SPLC needs to show its work. We’ll find it hasn’t done any. I cannot find the source, but I recall a study or analysis a little over a year ago that cataloged the history of claims from SPLC. My memory says that a good portion, on the order of 25 – 30% of their claims over time of the existence on nature (hate) of groups had been disproven. If anyone can find that, I would like to link to it and preserve it. Beyond their “accuracy”, how can anyone take a group seriously who admits, on the record, that they are only interested in far-right groups and do not follow or investigate any left leaning groups. Surely this is a function of their funding. Are they therefore not more of a Media Matters than, say a Pew Research Center in their nature? They DO follow and list groups like Voz de Aztlan. What I find interesting is even when they DO list them, they categorize them under “general hate”. They have no trouble calling white supremacists what they are. Why choke at calling brown supremacists what THEY are? If I had time in the middle of the day I would look up some of the studies over the past few years, but I seem to recall a lot of ink about the SPLC for each of the over-publicized shooter incidences and especially during the Occupy XYZ effort. One of their spokesperson’s was quoted, admitting that they don’t have “enough resources” to focus much on left leaning groups. That, in turn, started a fuselage of research and studies, finding how significantly their focus had shifted over time. Whereas they were more earnest and fair in the early days, they had become primarily focused on far-right groups and as the Prof notes, they had entered an era of high-bias via their reported results (high-bias that leads to fabrication?). Hence my comment they are more of a Media Matters than a credible research organization. Moreover, I recall they were pretty cash-rich (hundred’s of millions in assets), but were still aggressively fund raising. A number of opinion writers concluded the shift to such a politically oriented activity was tied to the funding raising. It’s not clear if the shift drove the increasing donations, or vice-versa. Is it possible that they through in a token non-far-right group from time to time, or that they actually find a few leftist groups so threatening that they bear mention? Auto-correct is a bad thing – I intended to say there was a “fusillade” not a “fuselage” of investigation into SPLC. As I’ve said, I consider them just another organelle of the Collective. A lot of their stuff is really risible, such as their “categories”, which list several different species of white hate groups under some weird morphology. I suppose for the purpose of trying to make it seem like white people are just more hateful. Warning! — according to SPLC’s New York listings, YOUR blog contains links to a “hate group” (a/k/a Pamela Geller). P.S. — I’m not sure how many more anti-SPLC, pro-Chick-Fil-A, or SNCG posts will be tolerated before you earn your own personal listing on their map. By their excesses over the last few years the left has shredded the Social Contract that is necessary for Society to function. In Stanley Kurtz’s book, Radical In Chief, he outlines how the left, during the 70’s – 90’s, in particular, intentionally focused on making such radical-supporting/left-biased org’s possible – tax-exempt groups to “lobby” or do “charitable” work. However, their underlying intent (clearly documented in his book) was to use these to funnel public funds to radical leftist groups. Those that already existed, or were functioning as funding organizations for such “compassionate” non-profits, were targeted for take-over at the executive/board level (e.g. Annenberg Foundation, Woods Fund) to ensure funds go to radical leftist causes and non-profits – and conservative causes were cut off. A very good read – dark, detailed, not “light” reading. But it was hidden from public review quickly for a reason……it revealed the belly of the beast funding radicals. As of 2010 the SPLC had $175 million on hand yet it continues to aggressively fundraise. Ken Silverstein of Harper’s has written about the SPLC claiming to be too impoverished to fulfill its mission in its aggressive fundraising efforts more than once. Those who do a little research would learn the SPLC spends twice as much on fundraising than on their stated mission. Here’s a quote for one of Silverstein’s sources. I just put this on the Tip Line and it deserves to be spread far and wide. Maybe it’s time to call the SPLC for what they have truly become: a modern-day version of Maximilian Robespierre. But in the end, the “Terror” ended falling over the head of Robespierre himself: death by guillotine, for the man who had sent too many innocents to their deaths. Exactly. Whereas they may have served a useful purpose at one time, they are now part of the problem. They have exploited emotional appeals (and real threats) to a profitable extreme. Unfortunately, their business model offers no consideration for when there is no longer a legitimate threat. Their effort to extrapolate culpability has undermined their purported cause and their own legitimacy. I believe the relevant expression is “jumped the shark”. People keep telling me that the SPLC used to be good guys, doing valuable work, and it’s sad how they’ve degenerated into a joke. But people keep telling me all sorts of things that I later find out not to be true. And we now know that a lot of old lies were never sufficiently exposed because there was no ‘net. So I have no foundation for believing that there was ever a time when the SPLC was not a scam.